Each week for the duration of the exhibition, we’ll focus on one work of art from Renoir and Friends: Luncheon of the Boating Party, on view October 7, 2017-January 7, 2018. Like his good friend and fellow artist Pierre-Auguste Renoir, Gustave Caillebotte spent a significant amount of time on the Seine west of Paris painting scenes such as this one. Caillebotte was born into a family that made its money in the textile business and inherited a fortune. As a young man at his family’s country retreat on the Yerres River, he enjoyed rowing and paddling in skiffs. He eventually purchased his own property on the Seine in nearby Petit-Gennevilliers, which became a perfect base from which to participate in regattas and to develop his skills as a yachtsman. By 1879, Caillebotte owned his own sailboat, participated in regattas in Argenteuil, and had joined the Cercle de la Voile de Paris (Sailing Club of Paris); he became a vice president of the club in 1880. Renoir depicted Caillebotte in Luncheon of the Boating Party—he is the athletic man in the lower right, dressed for boating, with the hat not of an oarsman but of a gentleman sailor, and he appears to look right past all who surround him to the boats and the river beyond the balcony. Boating scenes were ideal for the two Impressionists, in its combination of a fashionable, contemporary subject with the painterly challenge of capturing sunlit figures and the river’s reflective surface. 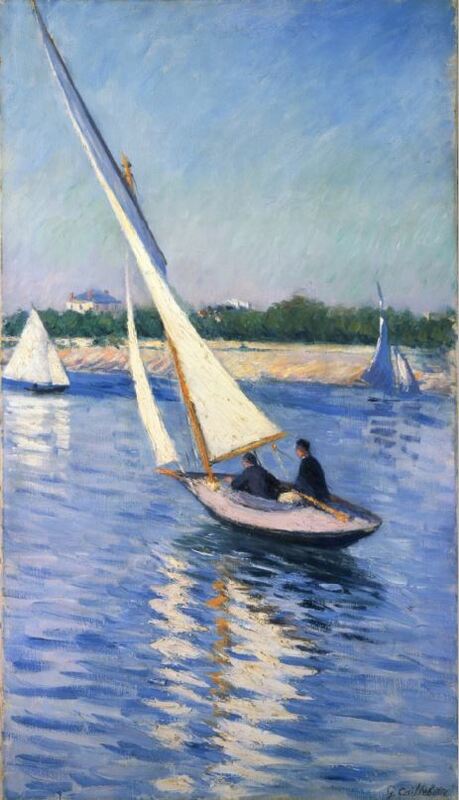 This entry was posted in Experiment Station and tagged boating, Gustave Caillebotte, Impressionism, renoir, Renoir and Friends. Bookmark the permalink. Please correct the typo in Argenteuil. Fixed, thank you for pointing it out.